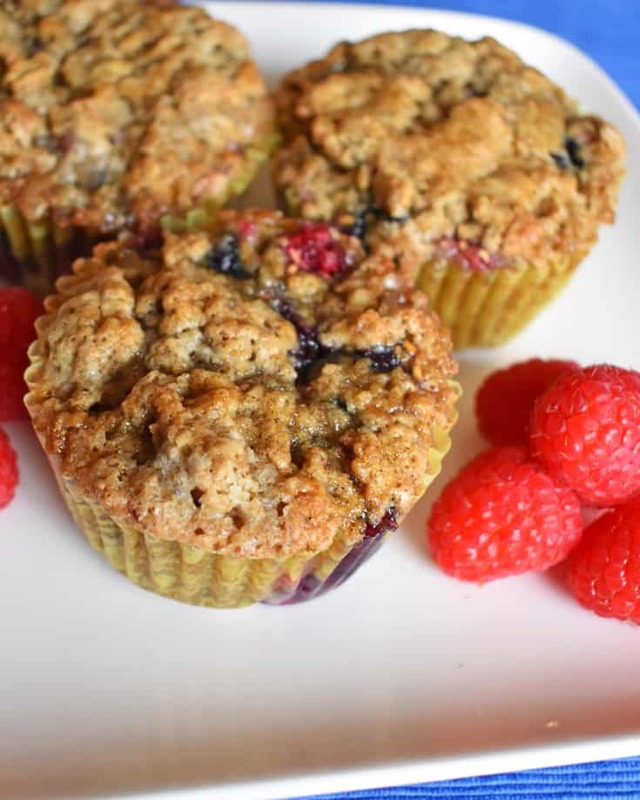 Triple Berry Gluten Free Muffins are bursting with fresh berries! They’re extra moist in the middle, crunchy on the outside and perfect for both a breakfast treat or afternoon snack! Now that the days are getting longer, and warmer weather is on its way, the time to start using the bounty of available fresh fruits is here. It’s also a great time to visit your local farmer’s market in search of the freshest produce available. Fresh berries are always a great addition to baked goods. Whether it’s blueberries, raspberries, strawberries, or in this case all three, the fresh berry flavors are a great reminder of summer. 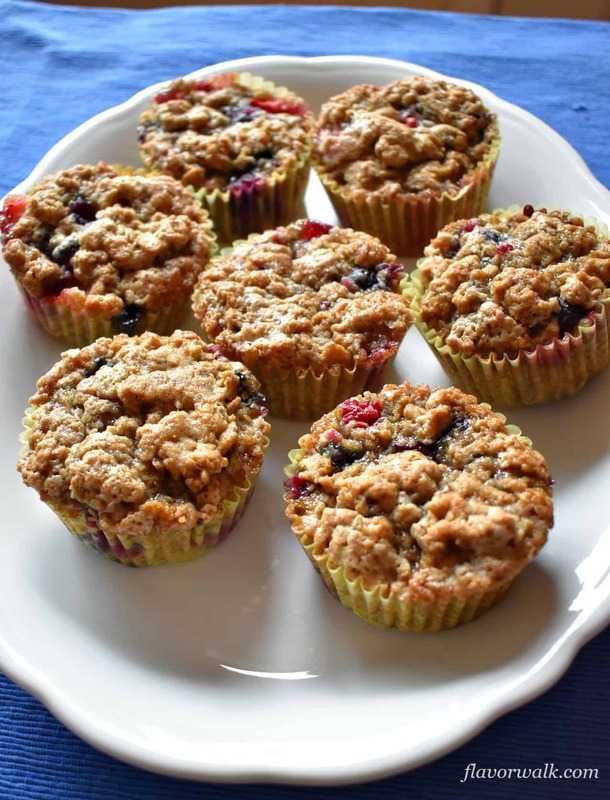 The inspiration for these Triple Berry Gluten Free Muffins comes from the Barefoot Contessa, Ina Garten. I’ve mentioned before that I enjoy adapting Ina’s recipes into gluten free versions. This one comes from her cookbook, “Barefoot Contessa at Home“. This recipe follows the standard muffin directions with the exception of adding the sugar at the very end. Simply mix all the dry ingredients (except the sugar) together. Then mix the wet ingredients, and combine the two mixtures. Gently stir in the berries and sugar, scoop the batter into the baking cups, and bake. It doesn’t get much easier than that! Unlike many muffin recipes that use oil, this one uses melted butter. The flavor of the butter really enhances the sweetness of the berries. Start melting the butter while you pull together the other ingredients. This will give the melted butter time to cool a bit before mixing it with the milk and eggs. You don’t want to scramble the eggs by mixing them with butter that is too warm. Line your muffin pans with baking cups rather than just greasing the pans. These muffins are very moist and the baking cups help the muffins keep their shape when you remove them from the pans. 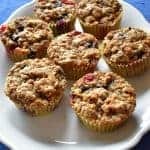 If you’re a berry lover (like I am), then this is a great recipe to combine blueberries, raspberries and strawberries into delicious muffins. If you prefer blackberries or boysenberries, you could substitute your own combination of fresh berries. 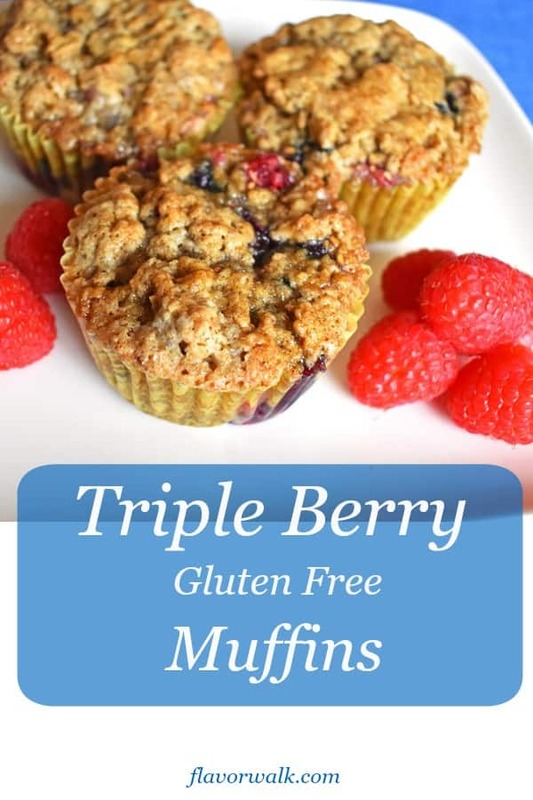 We’re big fans of these Triple Berry Gluten Free Muffins. They’re great in the morning with a big cup of coffee or tea. And they make a perfect snack for any time of the day! 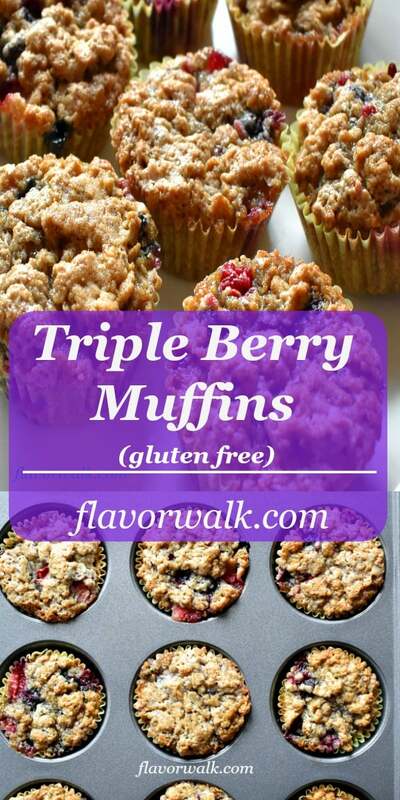 If you like baking with fresh berries, give these Triple Berry Gluten Free Muffins a try. I know you’ll enjoy them as much as we do. Happy baking!! 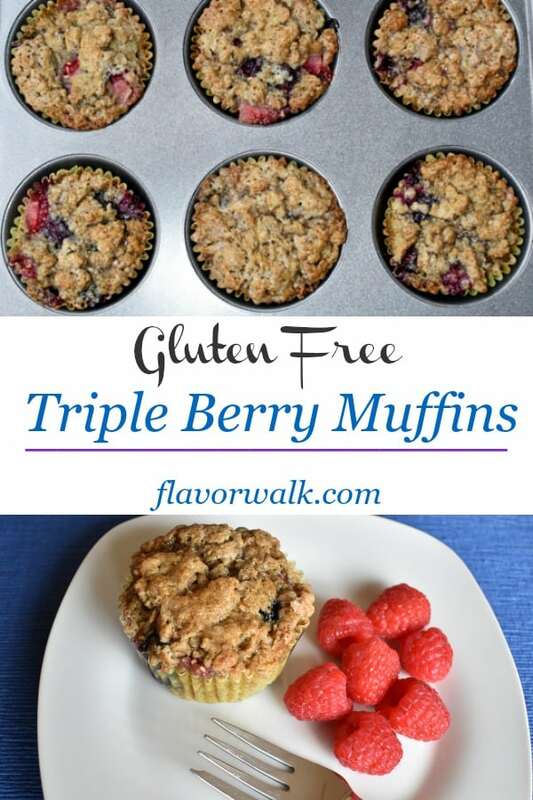 Triple Berry Gluten Free Muffins are bursting with fresh berries! They're extra moist in the middle, crunchy on the outside and perfect for a breakfast treat or afternoon snack! Preheat oven to 375 degrees. Line muffin pans with baking cups. In a large bowl, whisk together the gluten free flour, xanthan gum, baking powder, baking soda, salt, and cinnamon until thoroughly combined. In a medium bowl, combine the coconut milk, eggs, and melted butter. 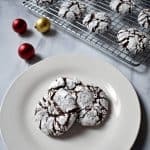 Pour the milk mixture into the flour mixture and stir until combined being careful not to overmix the batter. Add the sugar and berries and gently stir to combine. Spoon the batter into the baking cups up to the top. Bake for 20 to 25 minutes, until a wooden pick inserted into the middle comes out clean. Melt and cool the butter while you pull together the other ingredients. You risk scrambling the eggs by mixing them with butter that is too warm. 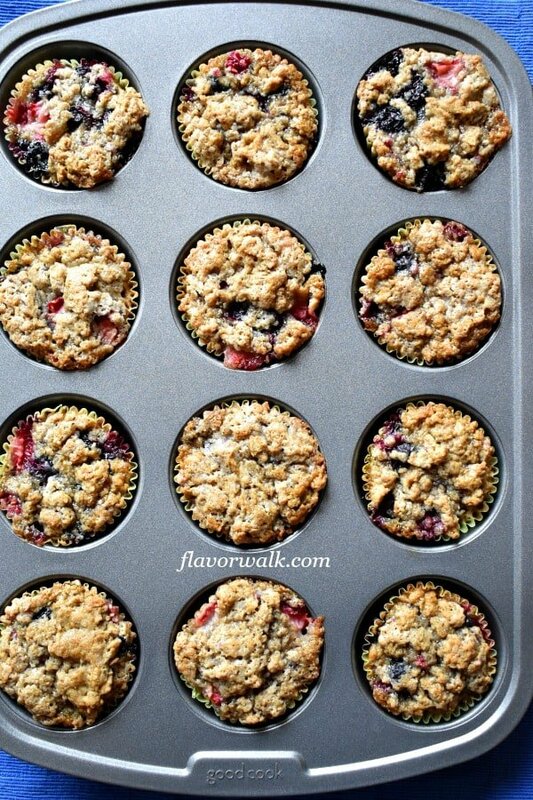 Line your muffin pans with baking cups. The baking cups help the moist muffins keep their shape when removing them from the pans.